BDCW ULTIMATE Skid Plates continue to be the top choice for expert riders, proving its worth in the most rigorous conditions and terrain worldwide Think you don’t need this much protection? Think again. It’s while learning to master big bike skills, both on pavement and off-road, that carnage happens. Rocks get kicked up, bikes get dropped and hung up, curbs get in the way, and scrapes and spills are just part of the adventure. And the ULTIMATE Skid Plate is designed to take all of the abuse—and more. 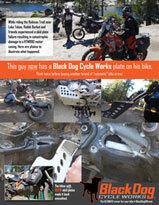 It's finally here, a skid plate for your lighter weight KTM dirt bike. Many of our customers have several bikes in their stable and whether they are a KTM or BWM adventure bike rider they often have a lighter weight KTM dirt bike for their gnarlier off road rides. Utilizing our vast experience in developing the toughest skid plates on the planet for large adventure bikes, BDCW has decided that smaller bikes are worthy of equal protection. It is not unusual to take lighter dirt bikes on even more difficult and remote terrain, making not having the best protection available an even bigger risk. Utilizing our vast experience in developing the toughest skid plates on the planet for large adventure bikes, BDCW has decided that smaller bikes are worthy of equal protection. Developing a full protection, maintenance friendly, lightweight design for smaller dirt bike was the primary goal in developing our first skid plate for dirt / dual-sport bikes and we feel the end product meets all our criteria, while of course being manufactured in the U.S.
Our plate covers the engine block, clutch cover, water pump and ignition cover. Unique front mount which contains magnets to hold it to the frame while installing the front bolts, making alignment much easier. Given the short service intervals of these bikes, ease of maintenance was paramount during the design process. No holes to snag on rocks or branches. This plate glides on its own—right up over most obstacles without bolts, rubber sliders or rivets to catch or break off. The skid plate follows the profile of the frame to ensure optimal durability and toughness. Remove 2 bolts front bolts, loosen 2 rear bolts to remove for an oil changes and maintenance. Two stage process looks great and takes the punishment that anodized finishes can’t. No bones about it, we manufacture all of our Black Dog products right here in the U.S. - supporting the local craftsmen, materials and machinery. It is extremely important to us. We have world class manufacturers in our own back yard and we are committed to supporting our local economy.